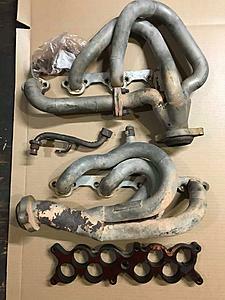 i have a set of used torque monster headers, egr tube, hardware, and intake spacer for the 5L second gen explorer. yes, they do have some rust on the passengers side, but they are still structurally sound (just cosmetic thats all). the egr was built larger in height with the spacer in mind, so the spacer will come with it. you will need head to header gaskets, as well as the gasket for the joiner tube on the drivers side (there is a gasket for a porsche that works with a little modification, the part number can be found on ef with a little searching). new, they are close to a grand with shipping, i am asking $650 US and i will ship across canada, and the lower 48. if you are elsewhere in the world, we can figure out a price.